Aizawl, Nov 12 : The two boys from Mizoram grew up together. They played and fought together, the younger following the footsteps of the elder. Siblings chief minister Lal Thanhawla and Lal Thanzara spent their lives doing similar things and now both are members of Mizoram legislative assembly. Lal Thanzara has traced his elder brother's footsteps as the president of the Mizoram Football Association and as an MLA. He was also a parliamentary secretary. Now, another set of siblings is tracing their footsteps. State sports minister Zodintluanga and his brother Chalrosanga will, for the first time, contest the state assembly election together. Zodintluanga is seeking election from the Thorang constituency and Chalrosanga from the Lunglei West constituency. Both are contesting on Congress tickets. 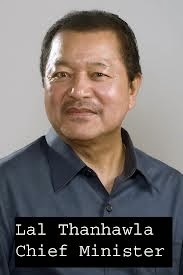 Lal Thanhawla and Lal Thanzara will try their luck again from Serchhip and Aizawl North-III respectively - the same constituencies from which they were elected last time. The chief minister, however, has the luxury of running for the election simultaneously from Hrangturzo constituency. While Zodintluanga has the upper hand in Thorang constituency, his sibling Chalrosanga will face an uphill battle in Lunglei West. Chalrosanga will be up against Mizo National Front (MNF)'s number two man R Lalthangliana, a former minister and the sitting MLA. Chalrosanga, however, is confident and said his perseverance and tireless effots would be blessed. "I'm thankful that the Lal Thanhawla-led Congress party has chosen me as a candidate and that they believe in the power of youth," he said. "I want to be a part of the community that is helping to build the community. So far this constituency has been neglected by its elected legislator. I wanted to make sure that the constituency gets what it rightly deserves," he said. Moreover, their sister Rosy Chalrotluangi - also the daughter-in-law of chief minister Lal Thanhawla - is busy attending to her father-in-law's second constituency - Hrangturzo.